With the Lunar eclipse happening once in a blue moon (all pun intended), what more appropriate way to marvel at this phenomenon, than to party at the beach, with beer in one hand, being with friends and accompanied by good music. Well, that was what Corona did last Saturday night. 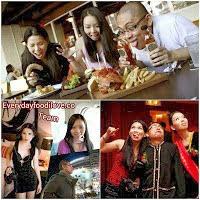 And we at Everydayfoodilove were lucky to be invited to attend this event. There were awesome games, music and much fun to be had that night. Full of eye candies nonetheless as guys feasted on wet t-shirt contest. Heck, they even had a dunk tank game, where guys try to hit a bullseye which will result in pretty girls falling into a tank of water. Of course, the main attraction of the night was Corona beer. With the Mexican brew making its ubiquitous presence throughout the whole party. To top it off, there were also some beach boys surfing at the background, yes, you read correctly, SURFING. We don't often get to catch good waves around KK, but tonight was special, perhaps influenced by the Lunar movement (and what being an eclipse and all) or simply by the impeding typhoon, announcing its imminent arrival. In any case, it was a scene to be compared with the shores of Kuta, Bali, where unison of beach, surf, music give birth to an awesome time. Something that all KKians can and should be proud of.